Destined to the professionals who must to supervisionary artistic historical atmospheres like Museums the Archaeological Libraries, Archives, sites, Churches, and warehouses of art objects. New2steo logger is a revolutionary device that affords the remote monitoring of temperature, humidity of atmospheres. With its compact design and its remarkable autonomy, facilitate the surveillance in atmospheres where do the temperature and the humidity are crucial factors.? Logger the New2steo instantaneously transmits the data to a computer on hand for the monitoring radio or records the data in its memory until when they are not unloaded, always radio. Thanks to the software and the USB key with receiver built-in radio (wireless), it is easy to install and to shape until 500 "New2steo Logger" in order to form a net of sensors wireless. 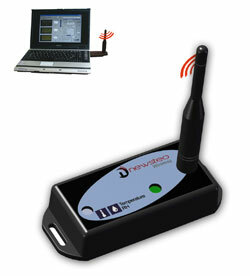 The USB key is the connection without thread between the PC of monitoring and the logger (wireless). The continuous transmission given in o/e the drainage of the recorded data is always made means of this key radio. Installment acquisition From 1 second until 4 hours. Possibility to add to thresholds, measures that they activate a system automatic rifle of recording of the corresponding measures. Art. 71145 single key USB wireless + software.